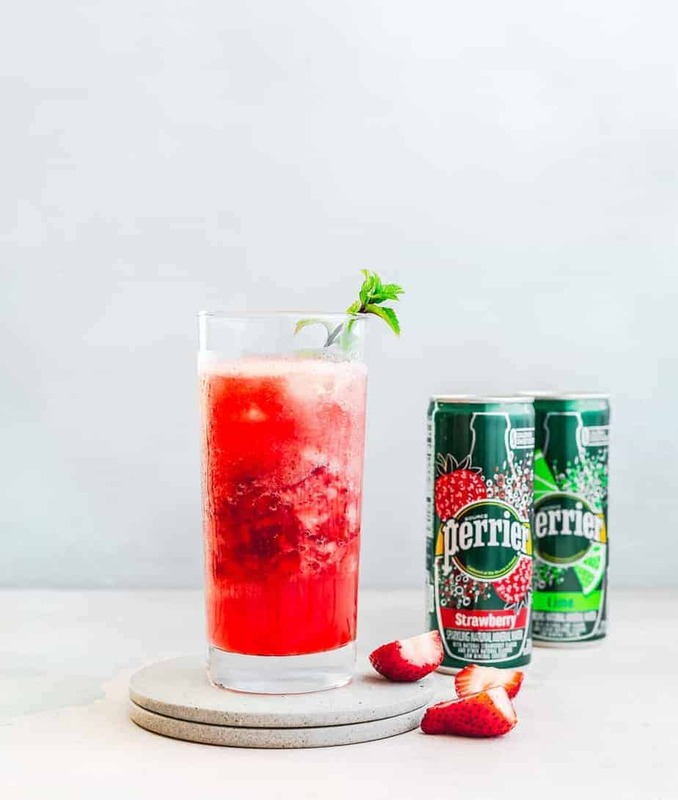 Home Recipes	Strawberry Smash Mocktail – Find Your Flavor Inspiration with Perrier! It’s a fun journey finding the true heart of a city. Here in San Diego there are quite a few spots that are lively and bustling, but a few in-particular have a unique authenticity about them. One of those areas is North Park, which is kind of an uptown spot that meshes different generations, different socioeconomic classes and cultures. There are fantastic restaurants ranging from farm-to-table dining to greasy spoons and even a joint that specializes in chicken-pot-pies! Other parts of San Diego may have more galleries with fine art, but nothing rivals the young and fresh art scene of North Park, which especially thrives during their night showings. The streets will be blocked off with warehouses and art collectives showcasing all types of paintings, performance art, and oftentimes live music and djs. The concert venues and coffee shops in the area get great acts, and there are movie screenings of foreign films and cult classics. I’ve been on a self-expression kick recently and have had fun tapping more and more into my creative side. From the food I cook to the way I dress I’m having fun taking more chances. This has been helped along by me spending more of my time in lively and artistic settings like North Park, Little Italy and Encinitas (all great areas for those visiting this fine city). It never hurts to breath some extra life into whatever you’re doing. We only live once, so have fun and stimulate the senses. 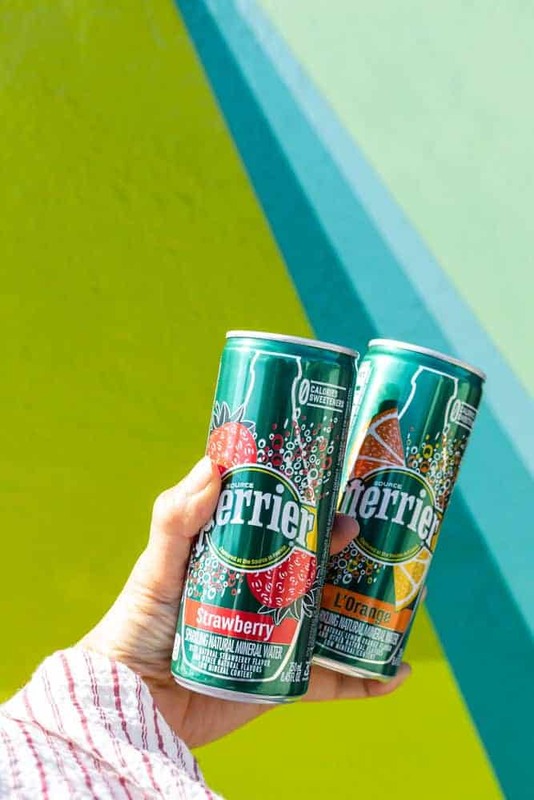 Perrier Carbonated Mineral Water has some vibrant flavors that fit right in with this bold and refreshing take on life. I’ve been hooked on three of their flavors in particular: Strawberry, Pink Grapefruit and Lemon. I get a pick-me-up with amazing taste, yet don’t have to worry as there are no sweeteners or calories. 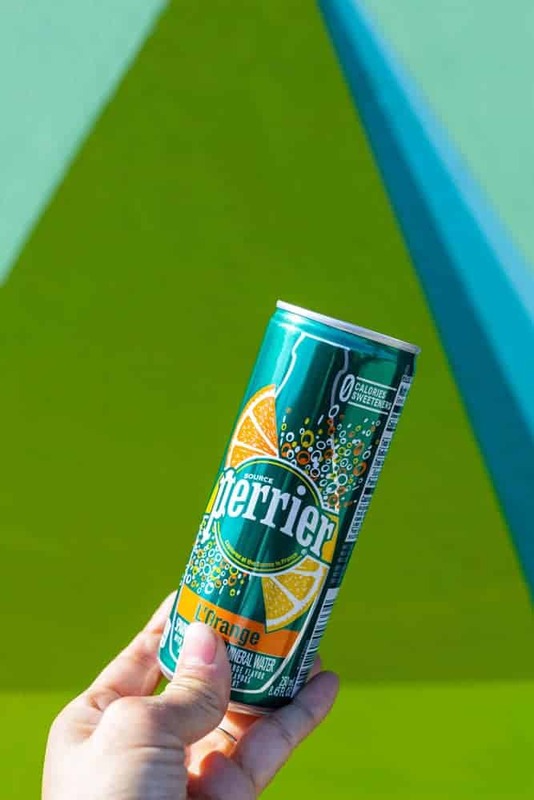 Perrier is and always has been THE name in carbonated mineral water. My husband drinks the L’Orange as it has orange as well as lemon citrus flavors, we are definitely a Perrier household. I love that these come in perfectly sized cans, I can bring them on the go just about anywhere. 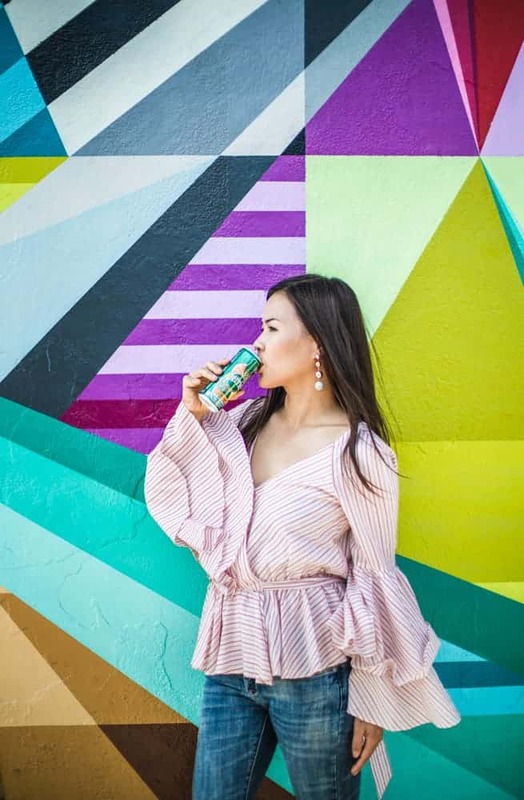 The tart and sweet flavors have been perfect for summer, when I especially need a brisk drink to battle the heat. These pics were captured right on the streets of North Park, which I think is fitting as the art is there for anyone and everyone to consume. The bright colors and diverse murals capture the essence of the area. I’m looking forward to soaking up more art and culture there and hopefully bringing forth more of my own artistic creativity in the months ahead. Place strawberries, orange juice, Perrier Flavor Strawberries, Perrier Flavor lime, and ice into a high speed blender. Blend until smooth. optional: Add agave nectar or any natural sweetener of your choice. Muddle the strawberries in a mixing glass. Add some mint leaves, add all liquid ingredients and shake. Serve immediately. Now this sounds like a really interesting drink. I don’t do alcohol so I am always on the lookout for mocktail ideas as I do love a good one! This sounds like such a yummy drink! 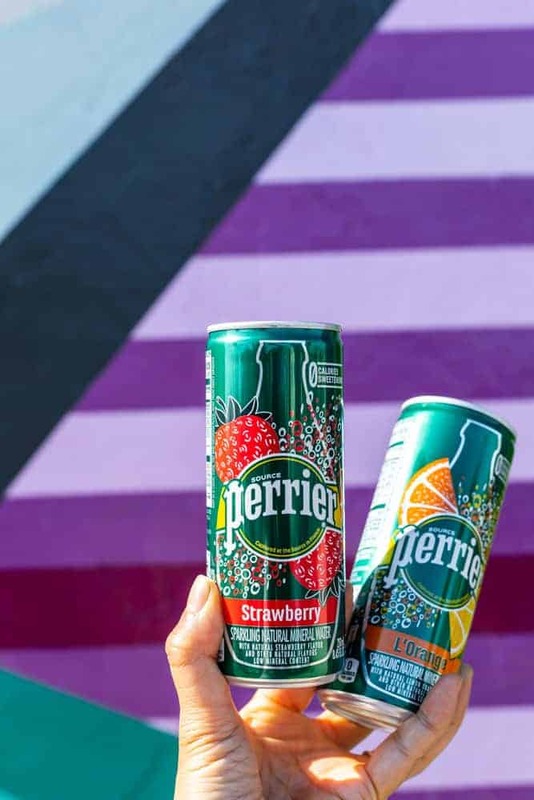 I don’t drink Perrier much, but I would love to try it in this recipe. I could go for one of these right now! I never turn down a Perrier but don’t know if I have ever mixed it with anything! 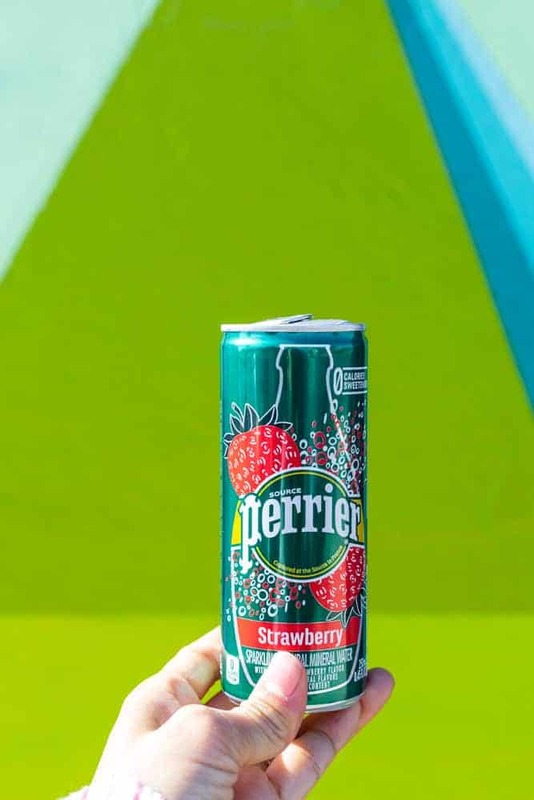 I love sparkling water, Perrier is delicious on its own so this drink recipe sounds amazing!